This cape, £129. The shape is absolutely to die for with enough tailoring to make it wearable for work. Although we're not sure if capes will still be in come Autumn/Winter 2011, we're sure that this one will last longer than all the others thanks to the fact that it looks so much like a jacket with the surprise of being a cape. This winter coat, £150. 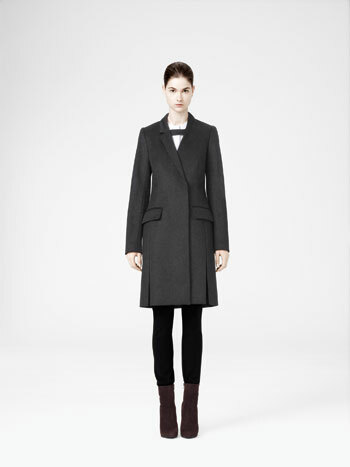 We're not going to lie - there are a lot of coats like this on the highstreet with the double-breasted-ness and the two front pockets and the slightly masculine feel to it... What we love about this one in particular is the strap detail right by the collar - we're not sure what it is or what it does, but it gives the coat a certain je ne sais quoi that sets it apart from all those other high street coats that do exactly the same thing. Beautiful and so very now. This pretty skirt, £49. Don't let the cold weather put you off wearing skirts this season. Don your best pair of thick opaques (I love 120 dernier tights) and brave the elements in this pretty crochet foil print skirt. We love how delicate the crochet makes it look but the foil toughens it up and makes it feel just a little bit Christmassy. Sorry for the lack of links - the Cos website doesn't seem to offer online shopping, only lookbook images so you'll have to pop in-store to try on these beauties.